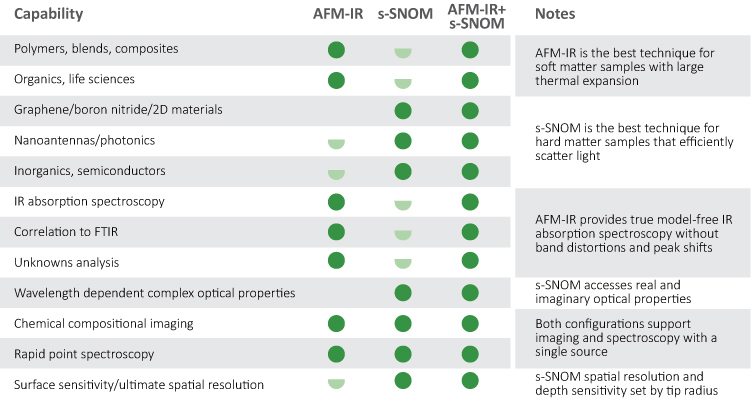 AFM-IR and s-SNOM are complementary techniques with different strengths. With the nanoIR2-s, you can choose a configuration that has one technique or both, depending on your sample and measurement needs. AFM-IR directly detects light absorbed by the sample using the AFM probe tip to sense thermal expansion. This thermal expansion depends primarily on the sample’s absorption coefficient, ks, and is largely independent of other optical properties of the tip and sample. The AFM-IR technique is thus preferred for measurements where an accurate absorption spectrum is desired. AFM-IR excels for soft matter studies owing to the high thermal expansion of these materials. s-SNOM detects light scattered by nanometer scale regions directly under the AFM probe tip. The scattered field depends on the complex optical constants of both the tip and sample and contains rich information about nano-optical phenomena. Reference samples (e.g. gold or silicon) are required to separate the sample response contributions from the source and tip. Modeling support may be needed to interpret the results. s-SNOM is a compelling technique for imaging nanoscale contrast in optical properties, with diverse applications in advanced materials, devices and fundamental light/matter interactions. s-SNOM works best for hard materials that interact strongly with light.